Iron ore prices are at a five-year low. The smaller producers are being squeezed out of the market. Vale (VALE) offer an attractive risk-reward. The iron ore price has fallen to a five-year low, to a price where only the top producers are making money. 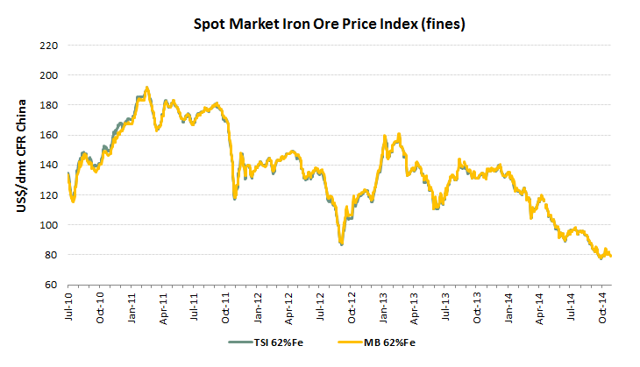 Spot iron ore at end of 3Q at about $78 per ton. Average for 3Q was about $90 per ton. In this first iron ore analysis, I will try to get a better overview of the market and the participants in order to get a clearer picture of the demand and supply side. I will find what I think are somewhat conservative but possible future iron ore price paths. In the next iron ore analysis, I will go into more details about the different companies, apply them to the possible future iron ore price paths in order to see if the companies offer an attractive valuation. I will start with company specific analysis of Vale (NYSE:VALE), and then continue with Rio Tinto (NYSE:RIO), BHP Billiton (NYSE:BHP), Fortescue Metals Group (OTCQX:FSUMF), Cliffs Natural Resources (NYSE:CLF), Anglo American (OTCPK:AAUKY), and then possibly some of the smaller ones. Many of the smaller producers, especially those in the development phase like e.g. Alderon (NYSEMKT:AXX), could go bankrupt. There are also several smaller Australian iron ore producers in the same situation. The smaller companies that survive the current downturn will have to cut back on their expansion plans. I have included many of the smaller Australian companies in the analysis below. At the end of this analysis, I will share all the company-specific analysis through simulationfinance.com. You can then see all the assumptions made, and make your own assumptions. This model allows to easily include uncertainty assumptions in the forecast. This allows the investor gets a much better understanding of the upside potential and the downside risk. I appreciate all feedback. The top producers of iron ore have lower costs than the smaller ones and are profitable at current iron ore prices. Vale, Rio Tinto, BHP Billiton, and Fortescue Metals Group controls almost 70% of the world's seaborne supply. This market share is expected to increase even further. Vale expects a volume of almost 350 Mt in 2015. Rio Tinto plans to increase output to about 330 Mt in 2015. BHP Billiton expects a volume of about 225 Mt in 2015. Fortescue expects a volume of about 115 Mt in 2015. Rio Tinto has the lowest cost at $42, BHP's is $51 and Vale is at $60 in terms of iron-ore landed in China with 62 percent content, according to UBS AG estimates. The top producers are all forecasting a lower unit production cost. BHP Billiton is targeting a 25% lower unit cost the next years. The top-producers also expect reduced capital expenditures. In early September 2014 Fortescue lowered its production target for 2015 to 115 Mt against an earlier target of 155 Mt. The move came only a week after Nev Power, Fortescue's CEO, told an industry gathering in Sydney he was confident the company could fund its AUD 9 billion expansion plan despite the current low iron-ore prices. This is the first major project already under construction that is being delayed. Fortescue also has reported that they are considering selling a power plant and a stake in its Western Australia magnetite project. These actions from Fortescue have reduced the likelihood of a potential equity raising. The company's debt is rated at 'junk' status, and Moody's has Fortescue on review for a possible downgrade. BHP Billiton has during the last years shelved many projects due to lower commodity prices, and during the first days of November it reconfirmed its decision to indefinitely postpone the Olympic Dam project. The Olympic Dam project was part of now defunct five-year plan to spend about $80 billion in digging new mines and other expansion projects. All 4 top producers are now continuously lowering their CAPEX forecasts, and increasing their cost savings forecasts. They are feeling forced to continue with some lower cost projects in order to prevent other producers entering the market. It seems like it's mainly the 3 biggest ones, Vale, Rio and BHP who has the ability to continue this expansion race. Based on company presentations, and the assumption that the total seaborne supply is 1400 Mt per year in 2014, and 1700 Mt in 2018. 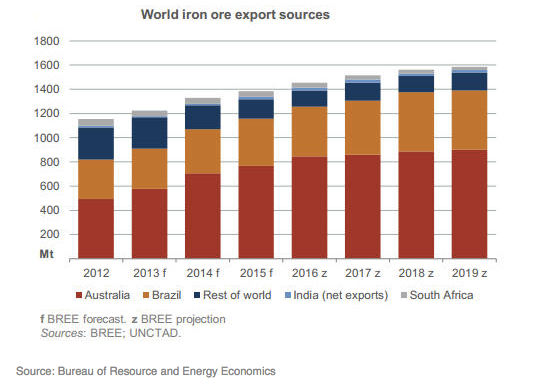 Assuming the world market demand for iron ore is currently about 2000 Mt per year and that it grows 2% yearly to reach a total of about 2150 in 2018, then there will be a total demand growth of 150 Mt. Comparing this total estimated demand growth of 150 Mt per year with the volume growth of the big 4 at about 300 Mt per year implies that other iron ore producers have to cut back their production with about 150 Mt towards 2018. I believe the 150 Mt production cutbacks will be done primarily by the smaller high-cost producers. Of these, there will be many Chinese producers. It may also be that the production increase by the top producers will be less than what they are currently forecasting. The top producers have an incentive to push down the prices in the short term in order to put the squeeze on smaller players. Cliffs recently notified the provincial government of Newfoundland and Labrador of its plans to shut down the Wabush mines which are the country's third largest iron ore operation. There are many indications that current price levels will force many of the smaller producers out of the market. Anglo American is one of the world's largest mining companies. The company's iron ore production is mainly through majority-owned Kumba Iron Ore in South Africa (about 47 Mt annually), and recently finished Minas-Rio operation in Brazil (about 25 Mt annually). The purchase and development of the Minas-Rio project is a stark reminder of how expensive a project may become. The Minas-Rio project was bought in 2008 for $4.6 billion from MMX, and the total development cost is estimated to be around USD 8 billion. Due to the huge miss on the Minas-Rio project, and their current relative high debt level, I do not believe Anglo American will do any new big projects for the foreseeable future. ArcelorMittal (NYSE:MT) describes themselves as the world's leading integrated steel and mining company. In 2013, they produced 70 Mt of iron ore and 8.8 Mt of coking coal. This production helps feed their world leading steel production of almost 100 Mt. Typically it takes about 1.5 ton of iron ore and around 450 kg of coke to produce a ton of pig iron. The steel industry is very fragmented and the world's top five steel producers controls only about 18% of global steel supply. The share price has been falling for years and currently trades near 52-week lows. ArcelorMittal has had a strategy of vertical integration, acquisition of iron-ore mines, to reduce its exposure to swings in prices. A very high debt level reduces ArcelorMittal's future financial flexibility. The credit rating has been cut to 'junk' by all the three major rating agencies. I do not believe ArcelorMittal will commit to any new expansion plans. Cliffs Natural Resources recently reported a net loss of $5.9 billion due to a write-down of $7.7 billion. Total revenues for the quarter were only USD 1.5 billion. The Bloom Lake operation will probably be shut down or sold within the next year. If Phase 2 were to be completed, Bloom Lake could produce about 13 million tons of high-grade iron or at a cost of about $54 per ton. The chairman said the company was to focus on its US iron ore assets (annual production above 20 Mt), but they were in no hurry to sell any assets in the current environment. The share price has fallen with about 60% YTD, and in October Cliffs amended its revolving credit facility with its syndicate of banking partners. They have a leverage ratio covenant of secured debt to EBITDA that is not to exceed 3.5. Their current total debt to annualized adjusted EBITDA is about 3.4. At the end of October Cliffs officially notified the provincial government of Newfoundland and Labrador of its plans to shut down the Wabush mines. Wabush mines are the country's third largest iron ore operation. My guess is that Cliffs is in a real hurry to sell assets. An alternative to selling assets would be an equity issue. I do not believe Cliffs will enter into a new project for the foreseeable future. LKAB is a relatively large state-owned iron ore producer in Sweden with annual production capacity of about 25 million ton. LKAB reported a loss for the current 3rd quarter. LKAB's capex strategy includes an expansion of production capacity of about 35% to reach an annual capacity of 37 Mt iron in 2016. Given that the company is state-owned and has little debt, I believe that the expansion will most likely occur. Atlas Iron has a yearly production of about 10 Mt and longer term plans to increase production to 15 Mt per year. They also have a longer term plan to increase production to 46 Mt per year. They report that all-in cash costs have been reduced to about $80 per ton and that further reductions in costs are expected in 2015. They guide for a production volume of about 12.5 Mt in 2015. Capex for 2015 is reduced relatively to earlier forecasts. In June, the company revealed that it was being paid discount rates for its low-grade iron-ore. I do not believe the company will get financing to expand production capacity in the current price environment. The share price has fallen more than 70% YTD. Alderon , an iron ore development company, which is planning an 8 Mt per year project on Labrador island, recently announced that they had terminated the engagement on BNP Paribas as lead arranger of the senior debt financing facility. Instead, they appointed much smaller Endeavour Financial Limited to act as their financial advisor. In their presentation, they forecasted Capex of $1.27 billion whereof $1 billion in debt. Cliffs Natural Resouces has just recently notified the provincial government of Newfoundland and Labrador that they plan to shut down their Wabush mines. I do not believe Alderon will succeed in getting debt financing for its project. I also find it hard to believe that investors will support an equity issue. The share price has fallen about 75% the last year. Australian Arrium has a yearly production of about 12 Mt iron-ore. Arrium has recently done an equity issue, but some analysts believe that they may need to do more. Credit Suisse analyst Michael Slifirski estimated that Arrium's higher-cost Peculiar Knob mine in South Australia has a cash cost of about $89 a ton. The all-in mining costs are reported at about $73 per ton. The share price has fallen almost 80% YTD. Mount Gibson expects a production of about 7 Mt in 2015. The company had a net cash position of about AUD 450 million as of June 2014. Current market capitalization is about AUD 475 million. The company reported a positive net profit for the financial year ending June 2014. The share price has fallen almost 60% YTD. BC Iron, another Australian iron-ore company, has a production target of about 6 Mt annually. The company had a net cash position of about AUD 100 million as of June 2014. Current market capitalization is about AUD 120 million. The share price has fallen about 80% YTD. Shree minerals a small Australian iron-ore company is currently operating at a loss, and the share price has collapsed. Western Desert Resources a small Australian iron-ore company with a yearly production of 3 Mt is operating at a loss. Western Desert Resources had an equity issue earlier this year. The share price has collapsed. South American Ferro Metals is an Australian listed iron ore producer with an iron ore project in Minas Gerais in Brazil. Annual production is about 1.5 Mt. Their iron-ore is sold to local steel and pig iron producers in Brazil, and to Vale and CSN. In 2012, the company commenced a Bankable Feasibility Study to expand the mine to a yearly capacity of 8 Mt. The completion of the study is expected in the second half of 2014. I do not believe they will get external funding for this project. The share price has been in freefall the last years, and YTD the share price is down almost 70%. In summary, I believe many of the smallest iron ore producers will cease to exist. Of the companies mentioned in this section, I believe only LKAB's expansion plan has a high likelihood of taking place in the foreseeable future. 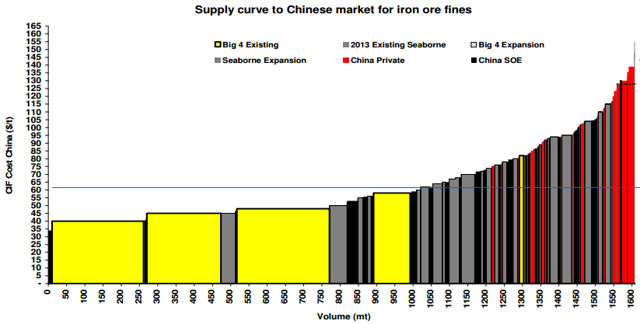 China buys almost 70% of the seaborne iron ore supply, and this growing import is gradually substituting domestic high-cost production. In the first nine months of 2014 there was a 17% increase in Chinese imports to a total of about 700 Mt. Some of the imports have fueled an inventory buildup, and inventories at Chinese ports have climbed almost 30% this year to a record 113 million tons in July. Steel production during the same time has increased with about 2.6%. Most iron ore producers in China have an estimated cost above $80 per ton. It is believed that some inland Chinese steel mills are paying a premium of up to 35% over seaborne benchmark prices. This may be due to long-term agreements, high transportation cost, captive mines, and perhaps close relationship between local government. Chinese domestic production or iron ore is expected to contract with about 10% to 15% in 2015 to about 280 million ton. It is estimatedthat about 25% to 30% of coastal mines in China have already closed. Vale believes that near 100 million tons of Chinese production is unprofitable at current prices. Vale believes that long-term Chinese domestic production will be around 200 million tons. Chinese production was about 350 million tons before the current low price environment started. 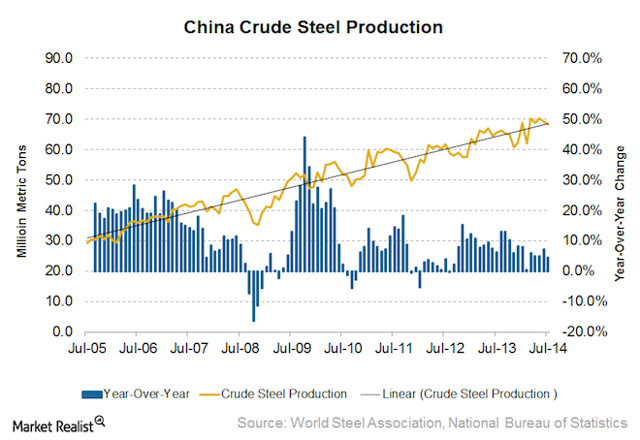 The World Steel Association releases China's crude steel output on a monthly basis. The data shows that China's crude steel production for July was 68.3 million tons, up 4.4% YoY. Estimated Chinese steel production in 2012 was about 717 Mt. Estimated total world production was about 1.520 Mt. Global seaborne supply of iron ore is expected to grow from 1.33 billion tons this year to 1.69 billion tons in 2018, Goldman Sachs estimated in a July 23 report. There are growing criticism of the top-producers' continuous volume expansions, most notably from Western Australian Premier Colin Barnett. Source: Theguardian. Smaller companies and new projects will experience greater difficulties in getting financing. The biggest consumers of iron ore are Chinese steel producers. BHP Billiton expects Chinese steel output to rise to about 1.1 billion tons in the next decade to support a growing urbanization. Production last year was about 780 million tons. Current swap future prices are very flat at about $77 per ton for both 2015 and 2016. The flat swap future prices make it even harder for the mostly small cash-strapped companies to get debt financing as they cannot secure future revenues at levels high enough for the banks to be able to extend credit. Most analysts are also predicting a future price at around $80 per ton for the next couple of years. The consensus is that iron ore prices will stay low for as long as it takes some of the high-cost production to leave the market. A possible catalyst for increased iron ore prices on the supply side may be bankruptcies among the smaller producers (which I believe will happen soon), further closures of production, as e.g. Cliffs closure of the Wabush Mines, and shelving/lowering of expansion projects. 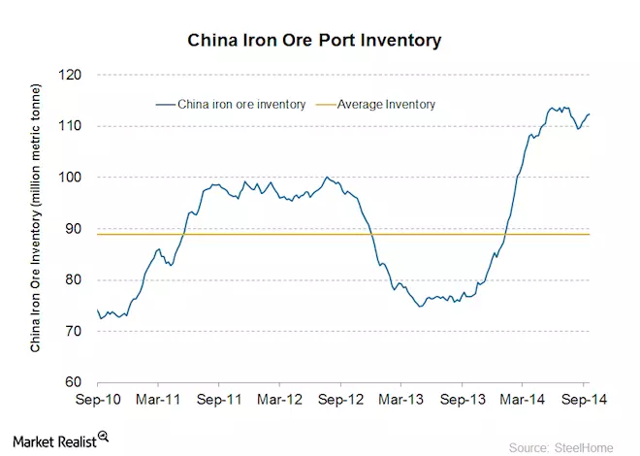 Another possible catalyst for increased iron ore prices on the supply side may be further closing of unprofitable Chinese iron ore production. 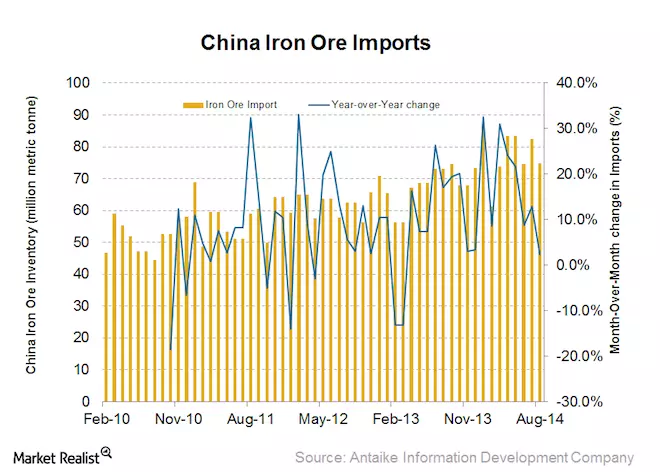 If unprofitable Chinese iron ore production is not closed down it will keep prices low. 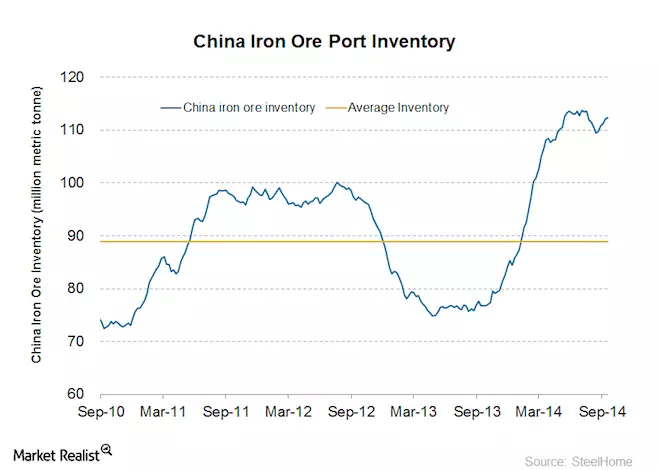 A possible catalyst for the iron ore price on the demand side may be a change in the industrial production mainly in China. The Bureau of Resources and Energy Economics, an Australian government economic research unit, expects the iron ore price to average between $90 and $95 per ton the next 5 years. 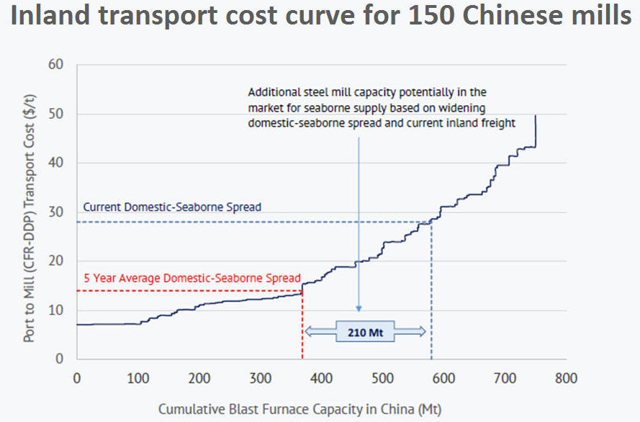 The fan chart shows the assumed possible iron ore price paths with included uncertainty assumptions. The black dotted line shows my main forecast. The darkest blue area shows the range that contains 75% of the calculated/assumed outcomes. The 2nd darkest blue area, together with the darkest blue area contains 90% of the calculated/assumed outcomes. The total blue area contains 95% of the calculated/assumed outcomes. 2.5% of the calculated/assumed outcomes are above the blue shaded area, and 2.5% of the calculated/assumed outcomes are below the blue shaded area. I will make a more thorough Vale article, but I would still like to include some charts here. I will also attach a link to the actual analysis so you can see all the assumptions made, and I appreciate all the feedback I can get. Average realized iron ore price for Vale in 3Q 2014 was $68 per ton. The volume forecast is based on Vale's forecast of a total yearly iron ore production of 450 Mt in 2018. 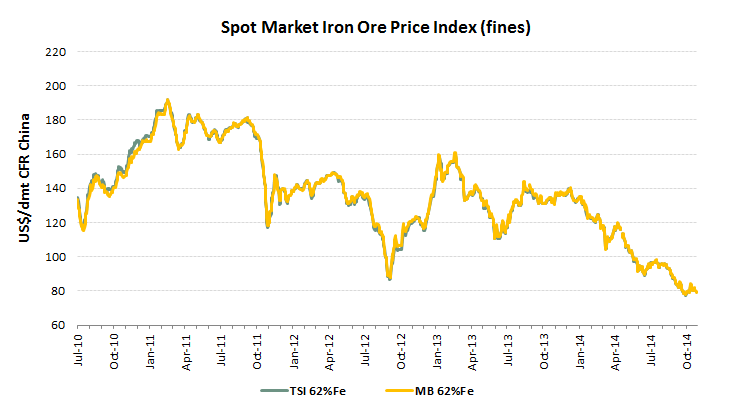 The 450 Mt also includes iron-ore used for Pellets production, whereas the above chart only includes iron ore fines. In addition, I have made assumptions about the other business areas of Vale. The distribution chart shows the valuation per share distribution based on all the calculated scenarios. The horizontal axis shows the valuation per share distribution, and the vertical axis shows the percentage of each outcome. The percentage shown on each bar is the accumulated outcome starting from the left. In this case 7.6% of the calculated outcomes have a fair value per share below $11.1, hence 92.4% of the calculated outcomes have a fair value per share above $11.1. Today the share price is about $9.5. Based on the above analysis I have bought Vale shares. Disclaimer: This article represents my subjective assumptions and opinions. I strongly recommend other investors to test and be critical of all the assumptions made and to form their own opinions. Disclosure: The author is long VALE. The author wrote this article themselves, and it expresses their own opinions. The author is not receiving compensation for it. The author has no business relationship with any company whose stock is mentioned in this article.